zulm.net • View topic - Sholay - How many versions? Sholay - How many versions? Post subject: Sholay - How many versions? Just how many versions are there of Sholay? I had originally thought there were just two versions, one which ends in Gabbar getting arrested, the other with Gabbar getting killed by falling on a spike. Last night I saw a version on Zee TV (UK) that I've never seen before! It had the original ending of Gabbar being arrested, but it was about 1/2 hour longer than the original! It has all these comedy sequences such as a 'hitler' style prison head and another joker. There was a scene where thakur 'tests' Veeru and Jai with some hired thugs to see if they can beat them. Also after Thakur got shot by a bandit at the beginning there was a fight added with Veeru and a bandit on top of the train. More scenes with the Imam and 'Ahmed'...and Basanti. Veeru and Gabbar's fight appeared slightly longer. All in all, it wasn't better than the original, it appeared rather dissapointing due to the silly comedy, which I think was not needed and brought the film down - I'm glad it didn't make the original cut. But I wonder why they had originally cut the action out, the action made it even better. I would've prefered the Gabbar dying ending. By the way out of all the Sholay DVD's (Eros, DEI) which one is which version? and which one has better picture/sound quality? Is there any new or 'ultimate' version due out? I think the licence may run out on the Eros version...maybe a better label will pick it up? Is the current DEI or Eros version decent enough to spend money on? IMHO, Mr Khiladi, hindi dvd market, is SO PATHETIC, forget abt any thing better than what we r getting today! for $4-5 if u can get a a relatively better of 2-3 current version, of this title, on NON FREEZING media! I will go for that..If u really like Sholay! But, i hope u understand, the CURRENT STATUS of OLD, DEI/EROS titles, should be PIRATED by definition, so nor EROS, 0r BEI/DEI should be blamed for faulty dvd, TECHNICALLY speaking! 1) Eros-DEI: cropped to about 1.90:1, but the best quality version available. Theatrical version. --Theatrical release is by no means incomplete. It was redundant to show the metal studs being installed as they were not used in that version ending. Similarly the remaining scene differences are appropriate for the intensity of the version being presented. another difference, dei/eros version was remastered with higher bit rate and dolby surround, sound.. I think, eros is pseudo sound? I dont have that dvd any more to confirm, I saw the different ending and did not see any more use of it! Post subject: Once Upon a time and Sholay! I once thought Sholay was an original film that did not copy from any English-language film. It was amazing to think that Indians could come up with an Idea of a "curry-western" and actually do a good job. But the other day I saw 'Once upon a time in the west' by Sergio Leone - an excellent film, no doubt. There was a scene where a family are shot down by the villain and his men. Of course this was taken later in Sholay and changed around as the family killed is Thakur's family. No while I think that Sippy did a great job in translating this scene to fit his story, I was dissapointed to see that yet again an Indian director had to copy from a foreign film. I am unsure now whther other scenes in Sholay was taken from American or spagetti-westerns! As Indian's don't watch westerns much, I think Sippy may have fooled the whole of India with people thinking it's all his work. Of course, the director of 'Once upon a time...' Sergio Leone himself has copied the story of 'A fistfull of dollars' from Akira Kurasawa's 'Yojimbo', so maybe it was only fair that part his film was copied by other asians - this time from India. Well actually, you could say the scene in Sholay was 'inspired' rather than copied as they are shot differently. Sholay is still one of thes best films from India and I wonder why there haven't been more "curry-westerns" like this. Maybe directors don't have the brain for them? The only other one I can think of is China Gate, which looks like a rip-off of the magnificent seven! (another copy of a kurasawa film). Looks like u r back, Khiladi, what happened to ur girly avtar!! U got mail yaar!! check it out! Yeah, though Sippy may have took it inderectly from 'The Magnificent Seven' - a western copy of Seven Samurai. There were a few Kurosawa films that were copied by the west - 'The Hidden fortress' was the inspiration behind 'Star Wars'. Thinking about it, there may be a few other films that Sholay could've taken inspiration from. 'Butch Cassidy and the Sundance kid' could have inspired the idea of having two crooks as friends, to be the main lead characters (Veeru and Jai). The films of Sergio Leone were a big influence on Sholay. I saw OUATIW a few months ago and too was disappointed to see that the scene in question was a copy. I thought Sholay was merely inspired by the style of Leone rather than direct lifts. OUATIW also has Charles Bronson as a harmonica-playing character, and there's a scene where someone shoots off Jason Robards' handcuffs. Sippy, like Leone, succeeded at putting those elements into a totally different setting, though Sholay more obviously uses typical Hindi cinema elements, albeit in a different manner than usual. From feudal Japan to the Old West to rural India. Didn't Sam Peckinpah use freeze-frames in The Wild Bunch, like in the family murder scene in Sholay? There must have been a feeling that Sholay couldn't be replicated, hence no copies. The ending also prevents the possibility of a satisfactory sequel, not that sequels were ever common in India anyways. 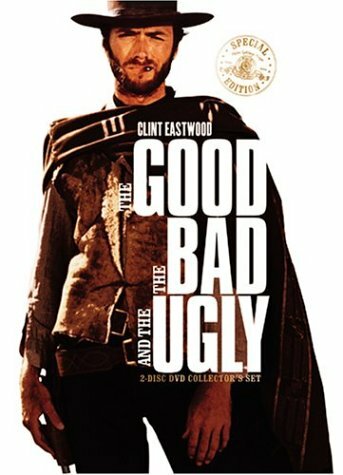 FYI, MGM is releasing a 2-disc edition of The Good, The Bad, The Ugly later this year. I spoke to someone today who recently saw OUATITW and you can guess that he was also disappointed to see that Sholay had copied from this film. I noticed the 'Harmonica' link, but didn't notice the handcuffs bit until you told me. I haven't had the opportunity to see 'The Wild Bunch' so I wouldn't know about the freeze-frame shot idea, though Leone used Freeze-frame at the very end of the 'Good, the Bad the Ugly' where the names of the characters appear with a freeze-frame of their faces. Today I learn't of another 'curry-western' that copied from OUATITW. 'Loha' copied a scene for the last song where Dharmendra and Karan Kapoor had to balance Shatrughan Sinha's son on their shoulders while he has a noose around his neck. This was probably taken from the flashback scene in OUATITW, where Harmonica had to balance his brother on his shoulders, whose neck was in a noose. Do you have any info on the GBU DVD as what would be extra on the 2nd disc? When I saw that scene in OUATIW, it looked extremely familiar. I don't know why. I wonder if more Indian films didn't copy that scene, possibly in the south as well. First, yes, to the best of my memory, and quite unlike popular rumour, the ZEE TV version does not show Gabbar being killed! This mention at IMDB is wrong! IMDB also lists different times for the U.S. theatrical release as 162 minutes... and this is what Mr Khiladi's notes may be all about. I also remember as a kid that what is being said to be the never screened director's cut - with Gabbar dying at the end - was actually screened but without Gabbar dying -- but it had all the extra long scenes in theatre that Ali-Rana have documented (Sachin being humiliated, separate full sequence of Hema being chased by dacoits without interspersed shots of Dharam in pursuit). So here's yet another version. Then I have two-tape Gold VHS which is around 3 hours 10 minutes (you can again factor in PAL 4% speedup) -- and it has those scenes cut out in the single tape VHS but does not have the Ali-Rana documented scenes of director's cut... In both my VHS, there are very small black bars above and below the picture... much less than the black bars seen on the genuine ULTRA (INDIA) DVD I have --- ULTRA black bars appear to slightly different from DEI-EROS black bars -- so we have several aspect ratios. I recently purchased an audio CD of Sholay... for the first time ever, the OST includes a qawwali -- yes, a 10 minute qawalli -- said to have featured Danny! I do not know abt Danny, but yes, my OST CD (MusicIndia Polydor) has this qawaali and a note on it! Now people say that initially this too was in the movie... wow! 3) It is odd that Uncensored version (Director's cut)has censor cert. attached and the censored version (EROS-DEI) has no censor cert. My ULTRA DVD has a censor certificate... and it does not show Gabbar dying at the end. My VHS editions too have the censor certificates. Question for Rana - can you please help us again by seeing the certificate again on the B4U version? Does it say "Sholay" only or does it say "Sholay sanshodhit" or "Sholay revised"? All my editions say "Sholay Sanshodhit." This appears to indicate what I faintly remember... that a more violent Sholay was screened for some time in the theatres (and which carried a censor certificate saying just "Sholay") and that it was replaced by "Sholay Sanshodhit." Separate from all this, I also remember that initially Sholay (theatrical) did not run -- that version was "Sholay," it had comedy scenes, and it had Gabbar NOT dying, and it also had all those extended B4U sequences in Ali-Rana notes. Everything the same except the ending! When it did not run, the film crew thought that possibly the villain still alive after so many "good men" and Amitabh dying was not acceptable to the public. So they reshot the end! Yes... if my memory serves me right, I read that they reshot the end with Gabbar dying, but at the last moment, thought best not to use that scene at all (in theatres...). Secondly, even in the Gabbar-lives version, as soon as the police arrives, there is a close shot of Sanjeev Kumar about to crush Gabbar's head by his metal-studded shoes... the studs are very visible I think so the "stud-fitting" scene is not really redundant. Last edited by newDEEP [go-green] on Sun Apr 27, 2008 4:19 pm, edited 2 times in total.